Malacca also has it's share of Perenakan cuisine. So before I move on to a different topic, let's continue our discussion on Malaysian food. 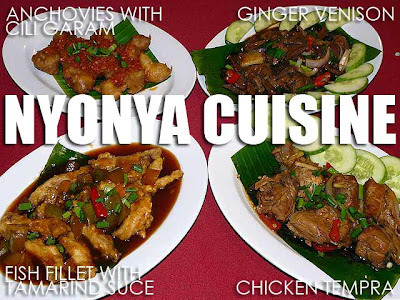 While we were in Malacca, we had lunch at a Nyonya restaurant called Seroni Nyonya Cuisine Restaurant. We were served a really sumptuous selection of Nyonya cuisine that included chicken tempra, fish fillet with tamarind sauce, anchovies with cili garam, ginger venison (deer), fried kampung rice, lemak prawns and stir fried okra. For dessert, we were given yummy bowls of cendol. While we did our walking tour around Jonker Street later in the afternoon, I also got to try out some of the goodies. There was a shop which sold pastries with pineapple filling as well as winter melon cakes (a.k.a. hopia). 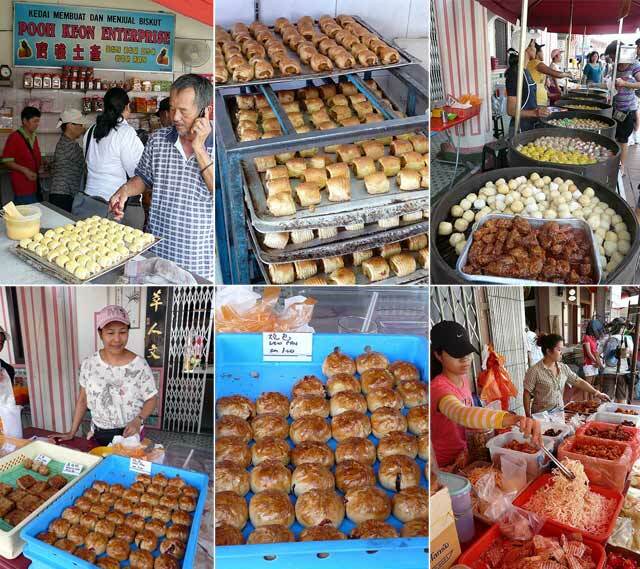 Along the street were a good number of hawker stalls which sold siomai, baked siew pau, radish and yam cakes, dried fish and squid, and other local stuff. It's sad that the chicken rice balls restaurant was closed by the time we arrived. It's really in-demand so it gets sold out easily and they close shortly after lunch. In Malacca, Hainanese chicken rice was modified so that the chicken is served with rice balls rather than a bowl of rice. nice food.. thanks for posting.